This article is about the island. For the sovereign state that includes the island, see Antigua and Barbuda. For other places named Antigua, see Antigua (disambiguation). For the Guatemalan city, see Antigua Guatemala. Antigua (/ænˈtiːɡ(w)ə/ ann-TEE-g(w)ə), also known as Waladli or Wadadli by the native population, is an island in the West Indies. It is one of the Leeward Islands in the Caribbean region and the main island of the country of Antigua and Barbuda. Antigua and Barbuda became an independent state within the Commonwealth of Nations on 1 November 1981. Antigua means "ancient" in Spanish after an icon in Seville Cathedral, "Santa Maria de la Antigua" — St. Mary of the Old Cathedral. The name Waladli comes from the indigenous inhabitants and means approximately "our own". The island's circumference is roughly 87 km (54 mi) and its area 281 km2 (108 sq mi). Its population was 80,161 (at the 2011 Census). The economy is mainly reliant on tourism, with the agricultural sector serving the domestic market. Over 32,000 people live in the capital city, St. John's. The capital is situated in the north-west and has a deep harbour which is able to accommodate large cruise ships. Other leading population settlements are All Saints (3,412) and Liberta (2,239), according to the 2001 census. English Harbour on the south-eastern coast is famed for its protected shelter during violent storms. It is the site of a restored British colonial naval station called "Nelson's Dockyard" after Captain Horatio Nelson. Today English Harbour and the neighbouring village of Falmouth are known as a yachting and sailing destination and provisioning centre. During Antigua Sailing Week, at the end of April and beginning of May, an annual regatta brings a number of sailing vessels and sailors to the island to play sports. On 6 September 2017, the Category 5 Hurricane Irma destroyed 90 percent of the buildings on the island of Barbuda. Residents were evacuated to Antigua. Rocky shoreline near St. John's. The first residents were the Guanahatabey people. Eventually, the Arawak migrated from the mainland, followed by the Carib. Prior to European colonialism, Christopher Columbus was the first European to visit Antigua, in 1493. Most of the Arawak left Antigua about A.D. 1100. Those who remained were raided by the Carib coming from Venezuela. According to The Catholic Encyclopedia, the Caribs' superior weapons and seafaring prowess allowed them to defeat most Arawak nations in the West Indies. They enslaved some and cannibalised others. Watson points out that the Caribs had a much more warlike culture than the Arawak. The indigenous people of the West Indies made excellent sea vessels, which they used to sail the Atlantic and Caribbean. As a result, the Arawak and Carib populated much of the South American and the Caribbean islands. Their descendants live throughout South America, particularly Brazil, Venezuela and Colombia. Christopher Columbus named the island "Antigua" in 1493 in honour of the "Virgin of the Old Cathedral" (Spanish: La Virgen de la Antigua) found in Seville Cathedral in southern Spain. On his 1493 voyage, honouring a vow, he named many islands after different aspects of St. Mary, including Montserrat and Guadaloupe. According to A Brief History of the Caribbean,[page needed] European diseases, malnutrition and slavery eventually destroyed the vast majority of the Caribbean's native population. There are some differences of opinions as to the relative importance of these causes. In fact, some historians[who?] believe that the reportedly abundant, but starchy, low-protein diet may have contributed to severe malnutrition of the "Indians" who were used to a diet fortified with protein from sealife. Others[who?] believe that the psychological stress of slavery may also have played a part in the massive number of native deaths while in servitude. Sugar became Antigua's main crop in about 1674, when Christopher Codrington (c 1640-1698) settled at Betty's Hope plantation. He came from Barbados, bringing the latest sugar technology with him. Betty's Hope, Antigua's first full-scale sugar plantation, was so successful that other planters turned from tobacco to sugar. This resulted in their importing slaves to work the sugar cane crops. According to A Brief History of the Caribbean, many West Indian colonists initially tried to use locals as slaves. These groups succumbed easily to disease and/or malnutrition, and died by the thousands. 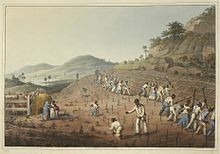 The enslaved Africans adapted better to the new environment and thus became the number one choice of unpaid labour; they also provided medical services and skilled labour, including carpentry, for their masters. However, according to a Smithsonian Institution article, the West African slave population in the Caribbean also had a high mortality rate, which was compensated by regular imports of very high numbers of new slaves from West and Central Africa. Sugar mills and boiling houses were two of the most dangerous places for slaves to work on sugar plantations. In mills wooden or metal rollers were used to crush cane plants and extract the juices. Slaves were at risk of getting their limbs stuck and ripped off in the machines. Similarly, in sugar boiling houses slaves worked under extremely high temperatures and at the risk of being burned in the boiling sugar mixture or getting their limbs stuck. Today, collectors prize the uniquely designed colonial furniture built by West Indian slaves. Many of these works feature what are now considered "traditional" motifs, such as pineapples, fish and stylized serpents. By the mid-1770s, the number of slaves had increased to 37,500, up from 12,500 in 1713. The white population had fallen from 5,000 to below 3,000. The slaves lived in wretched and overcrowded conditions and could be mistreated or even killed by their owners with impunity. The Slave Act of 1723 made arbitrary murder of slaves a crime, but did not do much to ease their lives. Unrest against enslavement among the Black Antiguans became increasingly common. In 1729, a man named Hercules was hanged, drawn, and quartered and three others were burnt alive, for conspiring to kill the slave owner Crump and his family. In 1736, an enslaved man called "Prince Klaas" (whose real name was Court) allegedly planned an uprising in which white slavers would be massacred. Court was crowned "King of the Coromantees" in a pasture outside the capital of St. John's. The coronation appeared to be just a colourful spectacle but was, for the enslaved people, a ritual declaration of war on the whites slavers. Due to information obtained from other slaves, colonists discovered the plot and suppressed it. Prince Klaas and four accomplices were caught and executed by the breaking wheel. (However, some doubts exist about Court's guilt.) Six of the rebels were hanged in chains and starved to death, and another 58 were burned at the stake. The site of these executions is now the Antiguan Recreation Ground. 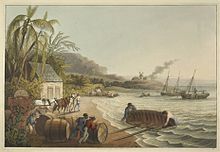 The American War of Independence in the late 18th century disrupted the Caribbean sugar trade. At the same time, public opinion in Great Britain gradually turned against slavery. "Traveling ... at slavery's end, [Joseph] Sturge and [Thomas] Harvey (1838 ...) found few married slaves residing together or even on the same estate. Slaveholders often counted as 'married' only those slaves with mates on the estate. "[a][b][c] Great Britain abolished the slave trade in 1807, and all existing slaves were emancipated in 1834. Horatio Nelson (who was created 1st Viscount Nelson 1801) was Senior Naval Officer of the Leeward Islands from 1784 to 1787 on HMS Boreas. During his tenure, he tried to enforce the Navigation Acts. These acts prohibited trade with the newly formed United States of America. Most of the merchants in Antigua depended upon American trade, so many of them despised Captain Nelson. As a result, he was unable to get a promotion for some time after his stint on the island. Nelson said "The Antiguan Colonists are as great rebels as ever were in America, had they the power to show it." A dockyard started in 1725, to provide a base for a squadron of British ships whose main function was to patrol the West Indies and thus maintain Britain's sea power, was later named "Nelson's Dockyard" in his honour. In 1968, with Barbuda and the tiny island of Redonda as dependencies, Antigua became an associated state of the Commonwealth, and in 1981 it was disassociated from Britain. Stanford International Bank was formed by Allen Stanford in 1986 in Montserrat where it was called Guardian International Bank. On 17 February 2009, the U.S. Securities and Exchange Commission charged Allen Stanford, Pendergest-Holt and Davis with fraud in connection with the bank's US$8 billion certificate of deposit (CD) investment scheme that offered "improbable and unsubstantiated high interest rates". This led the federal government to freeze the assets of the bank and other Stanford entities. On 27 February 2009, Pendergest-Holt was arrested by federal agents in connection with the alleged fraud. On that day, the SEC said that Stanford and his accomplices operated a "massive Ponzi scheme", misappropriated billions of investors' money and falsified the Stanford International Bank's records to hide their fraud. "Stanford International Bank's financial statements, including its investment income, are fictional," the SEC said. In 2006, the United States Congress voted to approve the Unlawful Internet Gambling Enforcement Act which criminalized the operations of offshore gambling operators which take wagers from American-based gamblers. This was a prima facie violation of the GATS treaty obligations enforced by the WTO, resulting in a series of rulings unfavorable to the US. On 21 December 2007, an Article 22 arbitration panel ruled that the United States' failure to comply with WTO rules would attract a US$21 million sanction. Antigua's obligations to the US in respect of patents, copyright, and trademarks are affected. In particular, Berne Convention copyright is in question, and also material NOT covered by the Berne convention, including TRIPS accord obligations to the US. Antigua may thus disregard the WIPO treaty on intellectual property rights, and therefore the US implementation of that treaty (the Digital Millennium Copyright Act, or DMCA)—at least up to the limit of compensation. Until July 7, 2015, the United States Air Force maintained a small base near the airport, designated Detachment 1, 45th Operations Group, 45th Space Wing (known as Antigua Air Station). The mission provided high rate telemetry data for the Eastern Range and its space launches. The unit was deactivated due to US government budget cuts. Commissioned, 9 August 1956, the Naval Air Station Antigua was one of the many underwater listening stations that were part of the Sound Surveillance System (SOSUS) and the Integrated Undersea Surveillance System (IUSS), which were used to track Soviet submarines. NAVFAC Antigua was decommissioned 4 February 1984. Antigua is located in the Leeward Islands. It has an area of 281 square kilometres (108 sq mi). Its coastline is 87 kilometres (54 mi). The highest place on the island is 402 metres (1,319 ft). There are various natural points, capes, and beaches around the island including: Boon Point, Beggars Point, Parham, Willikies, Hudson Point, English Harbour Town, Old Road Cape, Johnson's Point, Ffryes Point, Jennings, Five Islands, and Yepton Beach, and Runaway Beach. There are several natural harbours formed by these points and capes, including: Fitches Creek Bay, between Beggars Point and Parham; Nonsuch Bay between Hudson Point and Willikies; Willoughby Bay, between Hudson Point and English Harbour Town; English Harbour leading into English Harbour Town; Falmouth Harbour recessing into Falmouth; Rendezvous Bay between Falmouth and Old Road Cape; Five Islands Harbour, between Jennings and Five Islands; and Green Bay, the main harbour at St. John's, between Yepton Beach and Runaway Beach. 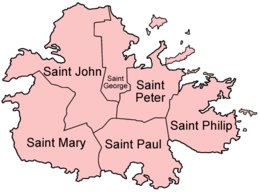 There are six civil parishes: St. George, Saint Peter, Saint Philip, Saint Paul, Saint Mary, and Saint John. The Antiguan racer is among the rarest snakes in the world. The Lesser Antilles are home to four species of racers. All four have undergone severe range reductions; at least two subspecies are extinct and another, A. antiguae, now occupies only 0.1 per cent of its historical range. Griswold's ameiva (Ameiva griswoldi) is a species of lizard in the genus Ameiva. It is endemic to Antigua and Barbuda. It is found on both islands. The country's official currency is the East Caribbean dollar. Given the dominance of tourism, many prices in tourist-oriented businesses are shown in US dollars. The EC dollar is pegged to the US dollar at a varied rate and averages about US$1 = EC$2.7169. 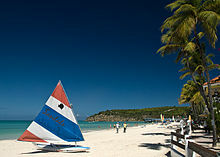 Antigua's economy is reliant upon tourism, and it promotes the island as a luxury Caribbean escape. Many hotels and resorts are located around the coastline. The island's single airport, VC Bird Airport, is served by several major airlines, including Virgin Atlantic, British Airways, American Airlines, United Airlines, Delta Air Lines, Caribbean Airlines, Air Canada, WestJet, LIAT, and JetBlue. There is regular air service to Barbuda. The growing medical school and its students also add much to the economy. The University of Health Sciences Antigua and the American University of Antigua College of Medicine teach aspiring doctors. Antigua was one of the very first nations to legalize, license, and regulate online gambling and is a primary location for incorporation of online gambling companies. Swiss American Bank Ltd., later renamed Global Bank of Commerce, Ltd, was formed in April 1983 and became the first Off-shore International Financial institution governed by the International Business Corporations, Act of 1982 licensed bank in Antigua. The bank was later sued by the United States for failure to release forfeited funds from one of its account holders. Swiss American Bank was founded by Bruce Rappaport. The major Antiguan sport is cricket. Sir Vivian ("Viv") Richards is one of the most famous Antiguans, who played for, and captained, the West Indies cricket team. Richards scored the fastest Test century at the Antigua Recreation Ground, it was also the venue at which Brian Lara twice broke the world record for an individual Test innings (375 in 1993/94, 400 not out in 2003/04). Antigua was the location of a 2007 Cricket World Cup site, on a new Recreation Ground constructed on an old cane field in the north of the island. Both football (soccer) and basketball are becoming popular among the island youth. There are several golf courses in Antigua. Daniel Bailey was the first athlete to win a global world medal at the 2010 IAAF World Indoor Championships. Being surrounded by water, sailing has been one of the most popular sports for years with Antigua Sailing Week and Antigua Classic Yacht Regatta being two of the regions most reputable sailing competitions. Hundreds of yachts from around the world compete around Antigua each year. Sport Fishing is also a very popular sport with several big competitions held yearly. Windsurfing was very popular until kite-surfing came to the island. Kitesurfing or kite-boarding is very popular at Jabbawock Beach. Local Antiguan Andre Phillip is one of the most famous kite-surfers in the world and spends much of his time training in Antigua and Barbuda. Robin Leach of Lifestyles of the Rich and Famous fame. Archibald MacLeish, poet and (U.S.) Librarian of Congress. Rachel Lambert Mellon, horticulturist and philanthropist, has owned a compound in Antigua's Half Moon Bay since the 1950s. Mary Prince, abolitionist and autobiographer, who wrote The History of Mary Prince (1831), the first account of the life of a Black woman to be published in the United Kingdom. Andy Roberts, the first Antiguan to play Test cricket for the West Indies. He was a member of the West Indies teams that won the 1975 and 1979 World Cups. Andriy Mykolayovych Shevchenko, Former Ukrainian footballer and politician. ^ Wells, J. C. (2000). Longman Pronunciation Dictionary (2nd ed.). Harlow, Essex: Longman. p. 33. ISBN 0-582-36467-1. ^ "Antigua Culture: Antigua & Barbuda Independence Festival". www.antiguanice.com. ^ a b Kessler, Herbert L. & Nirenberg, David. Judaism and Christian Art: Aesthetic Anxieties from the Catacombs to Colonialism. Accessed 23 September 2011. ^ Murphy, Reg. "Common Myths". Archaeology Antigua. Waladli versus Wadadli. Retrieved 4 September 2014. ^ CIA, The World Factbook. Retrieved 2 February 2012. ^ "For first time in 300 years, there's not a single living person on the island of Barbuda". ^ a b c d e "A Plan of the Estate Called Jonas's Situated in the Division of North Sound in the Island of Antigua, the Property of Peter Langford Brooke, Esquire". World Digital Library. Retrieved 19 April 2013. ^ a b Watson, Jack Brierley (1979). The West Indian Heritage: A history of the West Indies. London: Murray. pp. 9–10. ISBN 978-0-7195-3541-3. See also The Catholic Encyclopedia entries for "Arawaks" and "Caribs". ^ Rogoziński, Jan (1999). A Brief History of the Caribbean: From the Arawak and Carib to the Present (second ed.). New York: Facts on File. ISBN 978-0-8160-3812-1. ^ a b c Dash, Mike (2 January 2013). "Antigua's Disputed Slave Conspiracy of 1736". Smithsonian Institution. ^ Brian Dyde. A History of Antigua. ^ Dyde, B. (2000). A history of Antigua: The unsuspected isle. Interlink Publishing Group Incorporated. ^ Dash, Mike. "A little bit of background – the crucifixion of Prince Klaas". allkindsofhistory.wordpress.com. Retrieved 12 July 2014. ^ Brian Dyde, A History of Antigua, London & Oxford: Macmillan Education, 2000. ^ Oldfield, Dr John (17 February 2011). "British Anti-slavery". ^ Morrissey, Marietta, Slave Women in the New World: Gender Stratification in the Caribbean. Lawrence, Kans. : University Press of Kansas, 1989 ( ISBN 0-7006-0394-8), p. 85 and see p. 99 (author assoc. prof. sociology, University of Toledo). ^ a b c Robert Southey. The Life of Horatio Lord Nelson. ^ Rothermund, Dietmar (2006). The Routledge Companion to Decolonization. Routledge. ISBN 978-0-203-00264-3. ^ a b "Stanford Financial charged with 'massive' fraud". Stuff.co.nz. New Zealand. Reuters. 23 February 2009. Retrieved 4 September 2014. ^ a b Anna Driver (17 February 2009). "U.S. agents enter Stanford Financial Houston office". Reuters. Retrieved 24 November 2011. ^ Greenberg, Duncan (17 February 2009). "Billionaire Stanford Charged With Fraud". forbes.com. Retrieved 17 February 2009. ^ Goldfarb, Zachary A. (17 February 2009). "SEC Charges Stanford Financial in $8B Fraud". washingtonpost.com. Retrieved 17 February 2009. ^ Fitzgerald, Alison (17 February 2009). "Stanford International Bank Said to Bar Withdrawals Amid Probe". bloomberg.com. Retrieved 17 February 2009. ^ Jagger, Suzy (27 February 2009). "Top Stanford official Laura Pendergest-Holt charged with obstruction". The Times. London. Retrieved 24 May 2010. ^ "Offshore bank placed under receivership", Antigua Observer, 13 April 2012. ^ "Scotiabank announces new partnership, selling banks in the Eastern Caribbean". Antigua Observer Newspaper. 2018-11-27. Retrieved 2019-02-17. ^ "WTO - dispute settlement - the disputes - DS285". www.wto.org. ^ "US TKOs Antigua in bizarre WTO arbitration decision". ^ Kanter, James; Rivlin, Gary (22 December 2007). "In Trade Ruling, Antigua Wins a Right to Piracy" – via NYTimes.com. ^ "Antigua/Barbuda govt. official statement". ^ "Antigua Government Set to Launch "Pirate" Website To Punish United States - TorrentFreak". 24 January 2013. ^ a b "slysoft.com". www.slysoft.com. ^ 1st Lt. Alicia Wallace. "45th SW says Farewell to Antigua Air Station". Patrick.af.mil. Archived from the original on 13 July 2015. Retrieved 2015-12-23. ^ "Pages - NAVFAC_Antigua". www.public.navy.mil. Retrieved 2019-02-17. ^ Sajdaka, Richard A.; Henderson, Robert W. (1991). "Status of West Indian racers in the Lesser Antilles". Oryx. 25 (1): 33–38. Retrieved 12 June 2016. ^ "Antigua & Barbuda Archive Newsletter, Issue No. 64, April 2002". ^ "United States Court of Appeals, First Circuit. UNITED STATES of America, Plaintiff, Appellant, v. SWISS AMERICAN BANK, LTD., et al., Defendants, Appellees". No. 99-1012. 8 September 1999. ^ "Rappaport dies", Antigua Observer, 9 January 2010. ^ "Curtly Ambrose official website". Retrieved 17 April 2015. ^ Tahna Weston (7 January 2006). "SUN Weekend". Archived from the original on 22 August 2008. Retrieved 22 August 2008. ^ Alex Rose, "Berlusconi, Antigua, Report, Question Marks", 18 October 2010. ^ "Antigua and Barbuda: Murder rate higher than in New York – Scotsman.com News". The Scotsman. Edinburgh. 29 July 2008. Archived from the original on 22 August 2008. Retrieved 22 August 2008. ^ "Eric Clapton to auction guitars to benefit drug recovery cente – Aggielife". 24 June 2004. Archived from the original on 22 August 2008. Retrieved 22 August 2008. ^ a b Kevin Brass (12 September 2006). 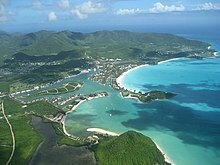 "Antigua recaptures its reputation for chic – International Herald Tribune". Archived from the original on 22 August 2008. Retrieved 22 August 2008. ^ Akeem Lasisi (18 August 2008). "Chimamanda in town for Fidelity Creative Workshop". Archived from the original on 22 August 2008. Retrieved 22 August 2008. ^ Charles D. Sherman (19 February 2002). "U.S. probes Cuban dolphin deals / The Miami Herald, Cuba News / Noticias – CubaNet News". Archived from the original on 22 August 2008. Retrieved 22 August 2008. ^ Saxon, Wolfgang (10 November 1986). "Dr. Fred Olsen, Industrial Chemist, Art Collector and Scholar, is Dead". New York Times. Retrieved 20 February 2015. ^ "Putting Antigua on the map". BBC News. 7 March 2002. Archived from the original on 22 August 2008. Retrieved 22 August 2008. ^ "Richie Richardson cricket academy at Antigua". Retrieved 17 April 2015. ^ "CaribbeanCricket.com – The Independent Voice of West Indies Cricket". 15 February 2004. Archived from the original on 22 August 2008. Retrieved 22 August 2008. ^ "The FABULOUS Homes, Planes, And Other Toys Of Oprah Winfrey". Article on Antiguan real estate. 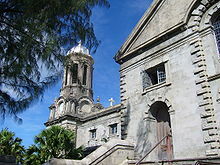 Wikimedia Commons has media related to Antigua.